If you’re a parent in Northamptonshire be sure to drop in to Old Scout’s Rugby Club tomorrow afternoon (Sunday July 15) for tea, cake and chatter about parenting. This is the launch of the Parent Project, which will see two young mums collect the experience of other parents to write a new play. The project also hopes to bring together folk in the same boat, and relieve some of the loneliness that may be felt by those enjoying the task of bringing up young children. The project will lead to a show in collaboration with Warts and All Theatre. ANOTHER week, another story about Corby’s shy and retiring Tory MP Louise Mensch, or Baggers, as she’s still known around here. This time it’s about how she announced to the select committee questioning James Murdoch that she’d be leaving 45 minutes before the end of the meeting to pick up her kids from school. Much praise and sympathy for Ms Mensch mostly via her Twitter followers, for showing the difficulties for working mothers in putting their children first. Er, was I the only one to think that it was a bit a joke, and that a man in the same position would never have got away with it? I’m all for feminism, and flexible working hours for families, but hey, it was LUNCHTIME. She is an MP. She was in an important meeting that she knew was only actually due to run for another 45 minutes after she left. And the trains to Corby run on the hour and take 70 minutes. It wasn’t an emergency and oh yes, she had her nanny in place in case she missed her train. I don’t want to bash other working women, far from it. But I do believe in equality. Was she treated equally alongside her fellow committee members? Is Tom Watson leaving early this week to take his children for their pre-school injections? “We have children the same age I think,” she giggled at Murdoch. Who cares? Does that make you friends? Argh! If I know I’ve got an important day of work diaried, then I try and sort extra childcare or make sure Bloke isn’t away with his own job. It doesn’t always work. Sometimes in an emergency I’ve had to call very wonderful friends to collect my offspring for me, or had to apologise and dash off early. I’ve even had to have one at work with me. And you can usually guarantee the more essential your presence is to the meeting, the more likely it is your child will fall ill, or have forgotten their swimming kit. But I’m pretty sure I haven’t ever announced on live TV that I’m leaving work, mid-meeting, at lunchtime, simply to pick up the kids from school. You want people to take you seriously as a working parent? Then at least try and be as professional as everyone else has to be. It’s true that like many jobs, the working day of an MP can very long and inflexible and probably needs reviewing. But this was certainly not the platform on which to do it. I TURNED the radio on halfway through a phone-in about childcare. A woman in her 60s was literally shouting, almost screaming, about how parents shouldn’t be helped by the state to pay for childcare. The reason for her anger? Because she hadn’t had it herself. She wanted the money to be used to give her a better pension instead. She was particularly riled by the fact that another caller, “the man with a foreign name” was defending his family’s position that both he and his wife had to work simply to pay the basic monthly bills. It baffles me how bitter, resentful, and sometimes gullible people can be about child-related benefits. They seem willing to believe that we are all churning out children we don’t really want, simply to enjoy vast piles of cash handed out by doe-eyed civil servants to allow us to sit and watch Jeremy Kyle. Or that ‘career’ mothers throw their offspring into nurseries run by automatons to earn money for expensive holidays and designer clothing. Working mothers are vilified for not staying home and looking after their kids. Stay-at-home parents are vilified for not working and contributing a wage and taxes. And the Daily Mail turns right-minded people into screaming bigots. We have the highest childcare costs relative to household income anywhere in the world, yet nursery nurses are not highly paid. If you want the economy to recover, you have to help people be able to afford to work, rather than give up their jobs, lose their homes, and depend on the state for far more than just the cost of a few hours a week childcare. WHAT did you do about strike day then? Take a day’s holiday or ring in sick? Go to work as usual and leave the kid/s with relatives? Take a day off unpaid? Go to work and pay £20+ for childcare? In fact, wasn’t it much like one of many teacher training days, when we have to run around trying to work out where to put everyone? nursery, and Jed and Dougie’s two secondary schools didn’t close, much to their disgust. It wasn’t half as dramatic as the school strikes I remember in the 1980s. Back then the strikes were frequent, sometimes three days on the trot, occasionally half-days (which meant a full-day if you lived out in the sticks and had an hour-long bus journey each way) and often random. For example, I remember not being able to do any sporting competitions or training at a point when I was Sport-Billy-Hilly, because the teachers wouldn’t supervise any extra-curricular activities. Maddening. The strikes dragged on and the teachers lost a lot of public sympathy, but the Teachers Pay and Conditions Act was passed in 1987, paving the way for a lot of the deals that today’s teachers wouldn’t have otherwise had. So do strikes work? Yes, maybe, sometimes, but not without a great deal of public discontent, often fuelled by misinformation. Meanwhile, away from the moaning placard waving educators and whining envy of private sector workers, I took a day off and Bill and I formed a plan for what we would do with our day alone together, a rare event. Any suggestions had to involve leaving the house. “Go to a toy shop?” he asked, hopefully. No. It would be better still if you think of something that doesn’t cost any money. Eventually, after much negotiation, we ended up at, er, the shops. I know, I know, but Billy wanted to use his own pocket-money to buy some weird wristband things that he’s seen his older brothers wearing. After his cash ran out I needed a coffee and somehow ended up with milkshakes and cake and a £10 bill from the aptly named Costa. Ouch. Then we found a huge sale on at Blacks and I bought far too many pairs of shoes for the men and boys of the house (although more than half price). Double ouch. 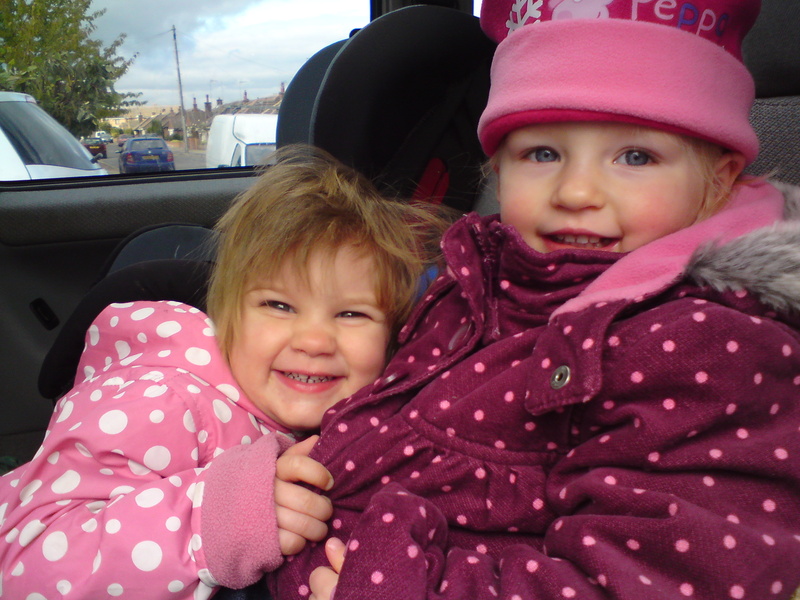 And with only a short time before Bonnie needed collecting from nursery, we had an emergency stop at MacDonalds. I should point out here that any time we eat at MacDonalds it is because it’s an emergency (ie, we have run out of time to eat anywhere else). I have the middle class paranoia that if I feed my offspring MacDonalds I am a Bad Parent. I refuse to call it a ‘treat’ because it’s just not. I stubbornly boycotted MacDonalds for 12 years, until Bloke and I were stranded on holiday in France and the only place open to feed our squawking toddlers was La Maison de MacDonalds. It pains me to admit it was a delicious breakfast. From that point on I felt a complete hypocrite. Especially as it was usually my bad parenting which literally drove us back time and again for Happy Meals (and fresh coffee) that you don’t even have to get out of the car for. MacDonalds is Prozac for the disorganised. 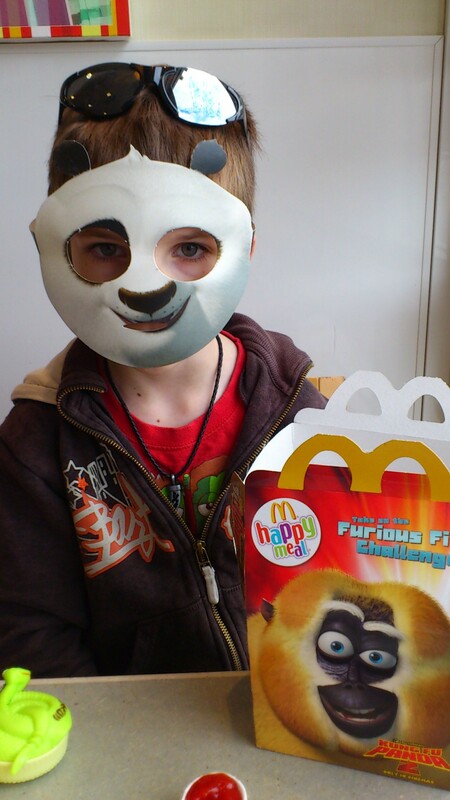 Billy and I did have a lovely, materialistic and expensive day together,which he was quite happy ended with wrist-bands, burger and chips and a weird Panda mask. Next time though, it will be cheaper to pay for the childcare. . .
END of an era for the kids this week, as Bonnie left our faithful Childminder Claire and moved to nursery. The change has come after six years, on and off, of family-home childcare, and it’s a bit of a wrench. Our older boys went to nursery when just a few months old. Things have certainly changed in a decade. Back when I had Child 1, if you hadn’t been at the same job for two years then you only got three months maternity leave. Now you can have up to a year off (mostly unpaid). At one point having Child 1 and Child 2 in nursery cost me over £850 a month. Which was more than I earned. I was £10 a month down. But I did it to hang on to a full-time job and (I thought), career. Scroll forward to 2003 and time for one year old Child 3 to need childcare. Fees had gone up, while our wages stayed stagnant. I was recommended Claire through a primary school teacher pal. It was not only cheaper to hire a childminder, but I got a good friend into the bargain. She looked after Billy full-time until he started half-day nursery at three-and-a-half, then went had him part-time before he started school. When I was running late she collected the boys from school for me. When I needed holiday cover she took them all in. Naturally, when Child 4 Bonnie came along, I went to Claire for childcare again, although this time I was a freelance, and my hours were much more erratic. When her own daughter, Leah, came along after two sons, Bonnie had a playmate the same age. The pair of them have been partners in crime ever since. They giggle like, well, little girls. Bonnie might be older by a few months, but two-year-old Leah is definitely the boss. But Claire has decided to pack in the childminding, and spend some one-on-one time with her own offspring. So Bonnie is off to the same nursery that her eldest brothers attended. It was funny and touching when we visited nursery with the boys, who haven’t been there for seven or more years. Lots of the same staff who looked after Jed and Doug as nippers were still there, and recognised them. There was much hugging and cheek-pinching, and bashful delight as the boys were told how tall and handsome they’ve grown. Bonnie’s started this week, and the early signs are that she loves it. Tables with dough on? Painting areas? Brilliant! But I suspect that despite all the new friends and excitement, she’ll miss her little mucka. I think we’ll be popping around for lots of cuppas to stay in touch. After all, Claire’s been like a second mum to Bill and Bonn. She’ll be missed.